Since day one when I got the car this has been bugging me big time. When I first looked at the car I looked inside and I spotted the damaged wiring which was down to the previous nut job of an owner shorting all sorts of things out and causing what looks like a small fire. I was told it happened when he was taking out the Air Con and dropped it on the loom. The bloke I bought it from said it was a quick job and cheap to replace. Ignorance is bliss at the time. That was before I realised there no wire loom for the wiper and I would have to replace the whole motor. Today I decided it was coming out as I need to replace it anyway. The internet and guides say it’s a fairly quick job. Was it? What do you need? 7/16ths sockets and a stubby 7/16th spanner, thin screwdriver and maybe a larger screw driver for leverage. Where to start? I had visions of me taking the motor of and leaving the bracket in place. But I was having trouble getting to the three 7/16ths bots that hold the motor to the bracket. This was down to the fact that the pivot arm that comes out of the motor through the bracket to the wiper control arms was not moving. So it was bite the bullet and take the bracket of. There are two bolts at the top of the bracket and two at the bottom. The two at the top are simple enough once you take the dash dials out. The two at the bottom are a nightmare. What made it worse was the fact my American Autowire fuse box was now in the way. To remove the wiper control arms there is a clip at the bottom of the left control arm, a screwdriver to lift the clip and slide it a fraction and it will ping off, so watch out where it goes. Once the clip is off if you’re lucky the arm will just pull off. Again a little twist of the screw driver and it came away no problem. The top clip for the right hand side was a total pig. The internet suggests that there should be another clip, but I had a C-clip and it was a real pain to say the least, I tried long-nosed pliers, circlip pliers and the screwdriver. The way I removed mine was to wedge my hand in the gap and hold the clip still while I levered up one side of the C clip. This worked and again pinged of into my hand. The top control arm lifted straight off once the clip was removed. Now was the turn to remove the bracket itself. The bolts at the top were easy access and I was going to remove the one on the left last and the one on the right first as it was slightly easier to get too. The removal of the top bolt(s) was a straight forward process, they could even be left in place to be honest. The bolts at the bottom were a completely different matter, they were located further forward almost on the firewall itself. 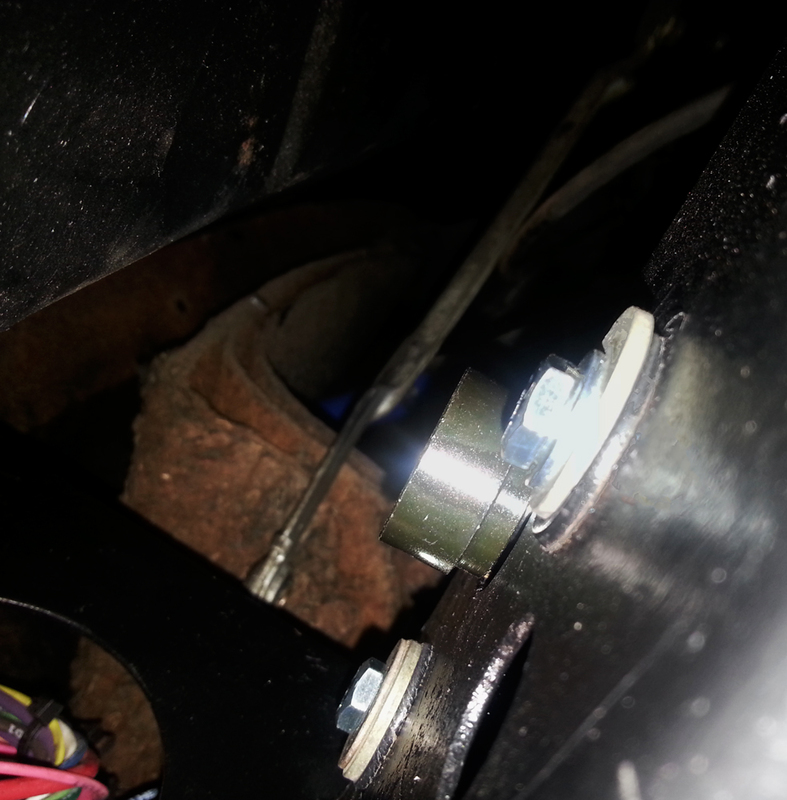 The only way I could get in to the bolt was via a 1/4inch drive flex head Snap On with an extension bar. The furthest away was the worst so I went for that first on the left hand side. I had one or two clicks on the ratchet at any time, it was slow and difficult as these had not been out for nearly half a century! Eventually the bolt came out and it was time for the right hand sides, I loosened the top left which was no issue, then I got to the bottom right. This was easy to see and a lot more forgiving to work in space wise. The bolt came out a lot easier than the left side. Once the bolt was almost out I took the weight and took the bottom bolt out. The top bolt was only there for guide as the slot moved away from the bolt and the whole bracket was now away from under the dash. Now if the car had original wiring I expect there would not have been much trouble. 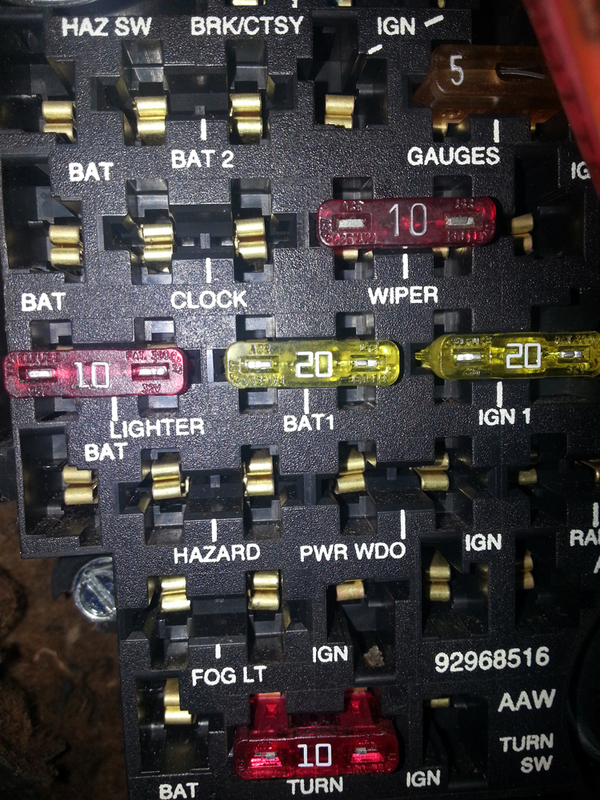 But as my fusebox was now there in the way it was an incredibly complicated removal process. I had to move wires around undo my cable tie clips just to give me room to manoeuver the wires out-of-the-way. Eventually after a while the bracket was free and the whole thing was out. Getting the bracket on the on the bench it was clear to see the damaged cause by the previous owner. The wires were broken, they had gone brittle and it was obvious there was a fire of some sort, but I can’t see any evidence of the flames apart from the melted plastic on the fittings and the wires. Next job was to remove the actuator arm from the motor. The arm is on a two flat key way and needed to be lifted up once the retaining bolt had been removed. I used a small bearing puller to ease it up. Once the arm was off the removal of the motor from the bracket was quite easy, the three bolts came were just a little over hand tight. There was a rubber grommet to the bracket that insulated the motor away from the bracket. The bolts had their own washers to hold the motor in place top and bottom sides. One of the motor bolt holes was actually broken, which can just be seen on the top left. Inside of the braket where the arm move. Next was to clean the bracket and de-rust it. FE-123 was used to treat the metal and then once dried I used Hycote Satin Black spray to the final coat. I was quite pleased with the results and I didn’t think the lacquer was going to be worth it. Last was the arm for the linkages, this was again treated and sprayed with the same process. Inspection of the arm showed no signs of wear and was in good condition. This is going to be done in two stages, the first will be the bracket put back in and then the motor once I get it. The little stubby spanners I have will get into the inner space no problem as the arm is off. locating the arm back on should be straight forward as there are two flats locate it. As the bracket now had no motor attached to it the location into position was much simpler, a bolt at the top to hold in place and then a bolt in the bottom right to locate the bottom position. The left hand side screw on the bottom was indeed the pig I was expecting it to be. I applied a small amount of grease onto the threads in order to help the process of starting the thread. This did work after about three attempts and getting more over the wires than the thread of the bolt. Again the flex head was the way to go and eventually tightened up. The bottom right was tightened and the top left bolt put in place and both the top bolts were tightened up. The gloss black finish is very good and finished with the New Port engineering sticker attached. The wires are quite long and reach the switch with ease. The first thing to notice is the size of the original motor compared to the new style motor. The new one is smaller than the original and a little lighter as well. The wiper actuator arm is a different design to the original. The new actuator arm’s design is a single spindle on the top. whereas the original motor had the pins split top and bottom in slightly different locations. The new design has the step effect for the linkage arms, the left wiper whole on the linkage being a fraction bigger than the right hand side. This obviously ensures the correct locating of the arms on the spindle. The knob on the switch is held in place on a flattened shaft held in position by a small grub screw into the plastic. There is a couple of ways to fit this motor. I would suggest that you do remove the original bracket from under the dash to mount the motor. It would make fitting a little easier than trying to fit the motor in situ as it were. But, it’s not to difficult to do it the way I had done it on the car. It’s recommended the wipers are in the park position in order to remove the wiper linkage. Once the motor is out there are three spacers that will sit in the rubber washers on the bracket. Keep the original washers from the original that have the larger hole in the middle as they will be required later. The next part was the motor to be offered up, the mounting plate fitted to the edge of the main bracket perfectly, and the top of the motor spindle fitted through the main bracket hole with only the smallest of gaps. The bracket was pretty much in position now and just need the final locating. I found the easiest way for this to be held in place was to put the screw into the rubber washer without any steel washers at this point in order to hold the motor in place at the top. The bottom fixing and the middle fixing I mounted properly, I put the larger washer on from the original motor mounting, followed by the smaller washer supplied for the bolt. The larger hole in the original washer allows for the spacer to be centrally located within the rubber washer on the main bracket. I found that here my only moan, the screws are only just long enough to reach the mounting plate with the fairly thick washers and rubber washers in place. The screws could have done with being a quarter of an inch longer. This would have allowed loose lining up of the bolt and thread onto plate. Also this would stop you having to press the motor into the rubber washer in order to get the thread started. This part took me the longest to do, once I had the two correctly spaced bolts in place I then removed the top bolt and replaced it with the washers as required. Using a small stubby spanner I tightened up the bolts to a good tension. Only one really; The supplied bolts were a little too short and mean that you have to squash the motor into place in order for the bolts to bite into the plate and try to locate the correct positioning. Perhaps a key way design for the locating of the actuator arm secured by a locking bolt would have been nice. But, the provided mounting works fine. If you want to keep the two-speed wipers and you have a motor that has died then this could be an option you. This is no way concourse correct as the original loom for the wiper motor is not used, nor is the motor marked up the same or even the same design. To keep the “stock look” of the original Mustang bezel you have purchase the optional “Switch Shaft Extension” at a further $20. I would like to have seen extension supplied with the motor. I can’t imagine for one minute anybody who owns one of these cars to use the knob on the switch supplied. This was a job waiting to be done but I was holding out for an original part, but it was not to be. I am well pleased with the results and lets face it, single speed wont cut it by todays standards. Before I do anything like this I tested the motor on an old battery I have that will not hold a full charge enough to turn a car over. I use the battery as my test rig and charge it up now and again. I tested the motor on the test battery first to make sure all was well before I fitted it! Awesome job! This was well written and the photos were clear and very helpful. I’m quite sure this saved me from hours of messing up and trying over and over! Thank you very much for taking the time to put this together.